yahoo weather japan has random stuff like UV radiation and “do i need an umbrella today?” indices, but I just found that they also have a beer index – on a scale of 1 to 10, on how much we want to drink beer in the summer heat. Of course, every day is beer day! Yay! Thank you, yahoo japan. Posted on: Friday, July 18th, 2008 at 8:37 pm	in: internet, japan, lol. 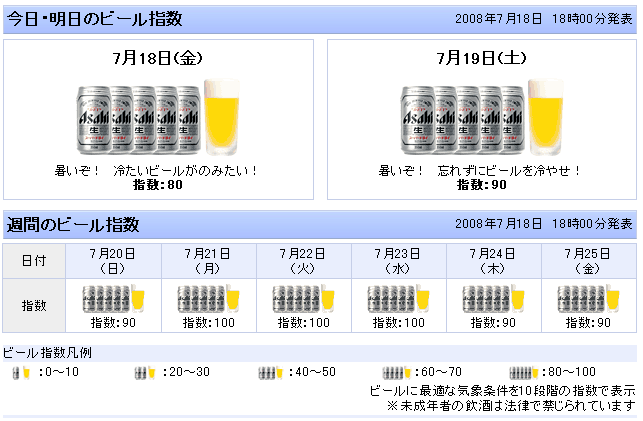 If you don’t drink 5 cans of Asahi every day, you’re clearly a gaijin subhuman.